So I thought I would too. 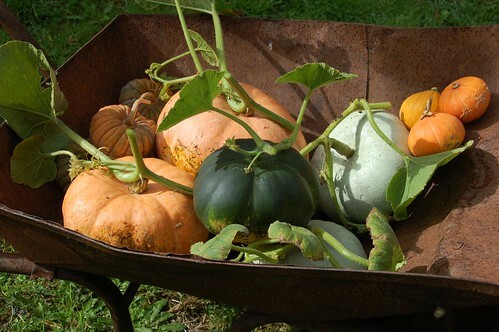 It's well into October so I've picked the pumpkins, squashes, cucurbits, what have you. Not a massive crop this year but that's probably o.k. as we usually have far more than we can eat and they often rot in store as I don't have enough warm dry places for them. The small corrugated dusky orange fruit are Black Futsu, which seems anomalous given the name but is expected behaviour for these moschata varieties. Rather small for type they should probably be about double the size they are and I blame the very hot summer for this. They were picked a few weeks back and have been maturing in the warm and dry. I've yet to try eating one so can't comment on the quality but I'm hopeful they'll live up to expectations. The largest orange pumpkins are without name or parentage but appear to be maxima. These are the plants I was expecting to be Pink Banana squash. I'll probably carve one for Hallowe'en but because they were grown in isolation I could possibly save seed if the eating qualities are good. Trouble is I'd need to grow them on for a few years to make sure the variety was stable and they just don't look interesting enough for that. The green one in the middle is another moschata, Muscade de Provence. If they didn't grow so large (this is a small one, barely mature enough to cut) these would be my favourite squashes, very fleshy and tender, excellent for cooking. But this was the only fruit on the last seed in a packet and very nearly didn't make it all all. For all that we've had a brilliant summer with wonderful air temperatures that slow chilly spring seems to have held back a lot of the more tender annuals just because the soil was so cold. Steely blue, compact and dense, the Whangaparaoa Crown (maxima) are holding my hopes for winning the place of 'house' pumpkin but I'd nearly lost the lot. These two are to be coddled and their seed saved for producing the Normandy adapted landrace of my dreams. Finally, the tiny orange ones are Gold Nugget. This is a bush type maxima which I'd never grown before. Again, I think the tennis ball sized fruit are perhaps a bit small for the variety but I've eaten one and it was good so because they're such tidy growers it's likely I'll try them again. Not pictured are this year's courgette choice, Trieste White cousa. Unusually the courgettes didn't run rampant this year and I've been more or less able to keep up with the four plants. They resisted mildew to the last and are still producing baby fruit but because of this good behaviour I have no marrows for store. I almost feel cheated by this. Are you ready for Hallowe'en?